Spud and Chloe have long been a fave of mine around the shop. It comes in 3 weights (sock, aran, and bulky), fabulous colours, and it’s machine washable. I still don’t usually put my knitting through the wash, but it’s nice to know nothing terrible will become of it if I do. There are a lot of great things to be done with Spud and Chloe and now they have their own book! Toy knitting is all the rage (I’ve even cast on some Easter wonders, more on that next week….) and this Spud and Chloe book really fits the bill. The book is a series of toy animals you might find on a farm. It kind of reminds me of childhood days on my grandparents farm. I was in charge of collecting eggs when we visited. The thing about toy knitting is its addictiveness. They are quick to knit up and toys always somehow look lonely on their own. It sounds silly but it’s true! I heard a rumor that Anina was working her way through the whole barnyard, I’m sure she’ll have it done in no time. 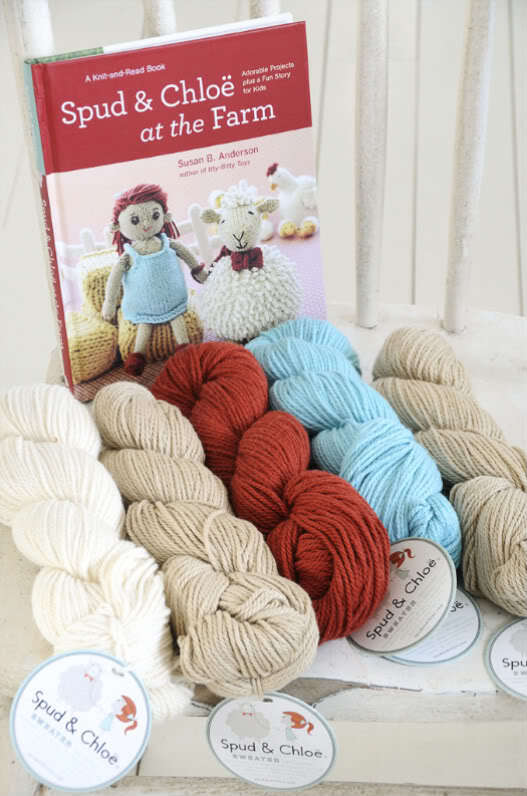 Pick up some double pointed needles, a couple of skeins of Sweater and At the Farm today! This entry was posted on Friday, April 8th, 2011 at 12:04 am	and is filed under Uncategorized. You can follow any responses to this entry through the RSS 2.0 feed. Both comments and pings are currently closed.